At used book stores I always make a beeline for the cookbooks, and once I find them, I zero in on any with those terrible plastic toothed spiral spines. The ones that inevitably fail to do their job of keeping the pages together. To me that spine means the book was compiled by a school, church, charity, etc. and will most likely contain a jackpot of cramped, typed recipes with strange names and an alarming abundance of shortening, sour cream, mayonnaise, whipped topping, and cans of condensed soup. Powerless to resist their grassroots charm, I have a large collection of these greasy-paged gems. I’ve noticed, however, that I never consider them when I am hunting for a recipe. Instead I turn to my coffee-table style cookbooks or the web, where I know I will see gorgeous photos and read dozens of reviews for every recipe. This seems unfair to my “novelty” cookbooks, so I have decided to turn to them more often in the coming months……and I am hoping they deliver. The bananas I bought last week had turned black ripened to perfection, so I chose a book at random, and told myself that I would make the banana bread recipe inside no matter what it called for. The ingredients list was what I expected (oh, hello shortening), but unfortunately, that was all there was. A title, list of ingredients, and the name of the contributor. No instructions. She must have assumed the women of the West Newbury Congregational Church knew their quick breads enough to figure it out. I accepted her challenge and put on my apron. And you know what? The bread came out just lovely. Nice banana flavor, crunchy walnuts, and a light crumb. 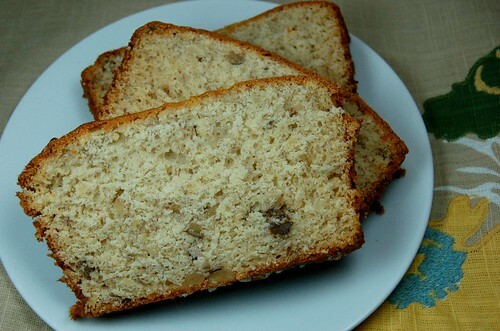 Banana bread and its quick bread cousins began showing up in American cookbooks during the 1920’s. They were “quick” thanks to relatively new leavening agents like baking powder and baking soda, which eliminated the need for yeast. Banana bread enjoyed its highest level of popularity during the 1960’s, perhaps because its combination of easy preparation and homemade taste made it the perfect choice for the modern working housewife. This explains why I know I can count on finding at least one version of it in every community cookbook I come across…with or without instructions. Preheat oven to 350 degrees, and grease/flour a 9×5 loaf pan. In a large bowl, cream together shortening and sugar until light and fluffy. Add eggs one at a time and beat until mixture is smooth. Add banana and lemon juice and beat a few seconds longer. In a separate bowl, sift together flour, baking powder, and salt. Gradually add flour mixture to batter, beating until well combined. Fold in chopped nuts, then spread into prepared pan. Bake for 50 – 60 minutes, or until a toothpick inserted into the center comes out clean. Print Version Because my mom keeps asking for it, I will now be providing printable versions of all recipes. The Food Timeline provided historical help in this post. I love gingham! Love the new name, the new website, everything! And the banana bread? Love that, too. The picture’s fabulous. This is perhaps the most hilarious entry for banana bread ever. I love your writing style and your description of your love for the spiral-bound cookbooks. Oh, how fun they are! I just love this blog! I will keep my eyes peeled, Stephanie! Yum. You know I have a penchant for these oldies/goodies too. Nice job adding the printable, I need to figure that out too. 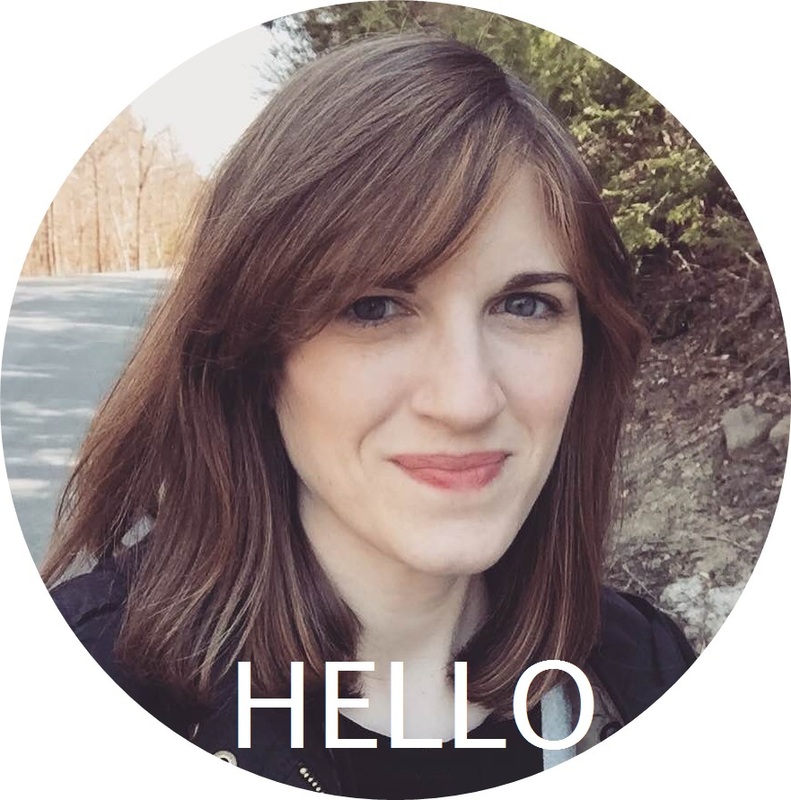 Google documents, Sarah! Super easy. I have been loving Nana’s Superbowl Week on your blog. Amazing stuff. I love what you’ve done to your website, awesome job! 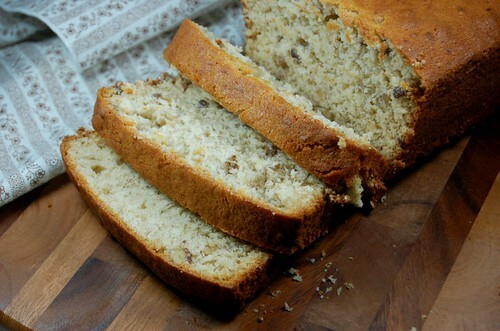 This banana bread looks delicious-I will try the recipe this weekend and let you know how it came out! Yay! Thanks, Fatima! I am hoping to try your Arroz con Leche recipe this weekend. Thanks again for sending it to me! I hope you love the Arroz con Leche, let me know how it goes! I love those cookbooks too but like you I rarely go to them, opting for the gloss too. I think I may take up your challenge too and try at least one recipe a month. Some of mine have recipes from family members recipes too. All the more to try them. I hope you share the recipes you particularly enjoy, the banana bread looks wonderful! Hi Mardell! Great idea! 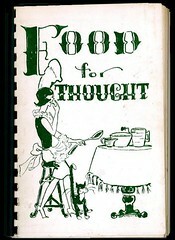 If you think about it, people were probably submitting recipes they knew were “crowd pleasers” to those cookbooks – so they must be good, right? It’s fun having no picture and no idea what you will end up with. Have fun! Great job creating a recipe from an ingredient list! And I don’t know if I’ve said it yet, but I am loving your redesign. 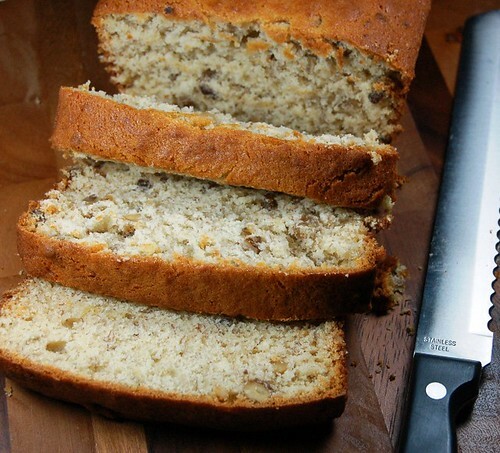 I love a good banana nut bread, this looks so tasty! A key ingredient in all those cookbooks I have is a can of crushed pineapple. It’s in every dessert or breakfast item. My Grama Polly gave me one from her church that is AMazing.